Just as job growth has accelerated and continues to improve, so too has wage growth. 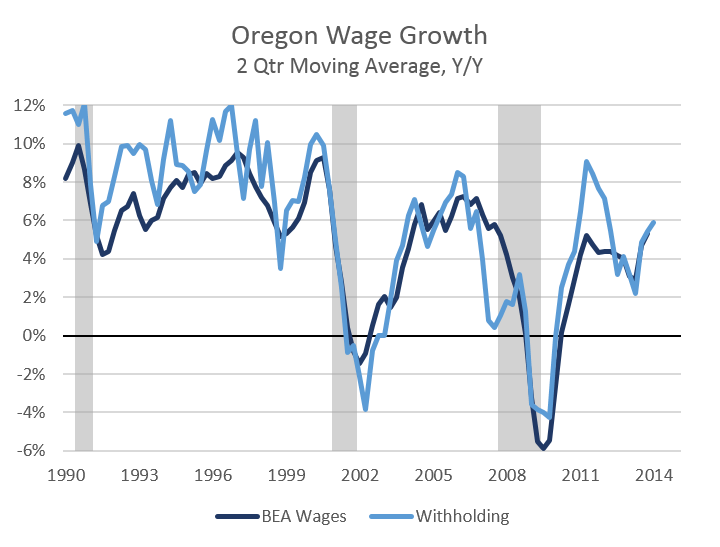 Right now both wages as reported by BEA and withholdings out of paychecks are growing at nearly 6 percent overall in Oregon. This rate of growth is nearly back to the rates seen during the housing boom, but remains below the 8-10 percent rates the state saw during the strong 1990s expansion. Unfortunately for many existing workers, this pick up in wage growth is due to the improving landscape for jobs overall and not due to average wages rising quickly. 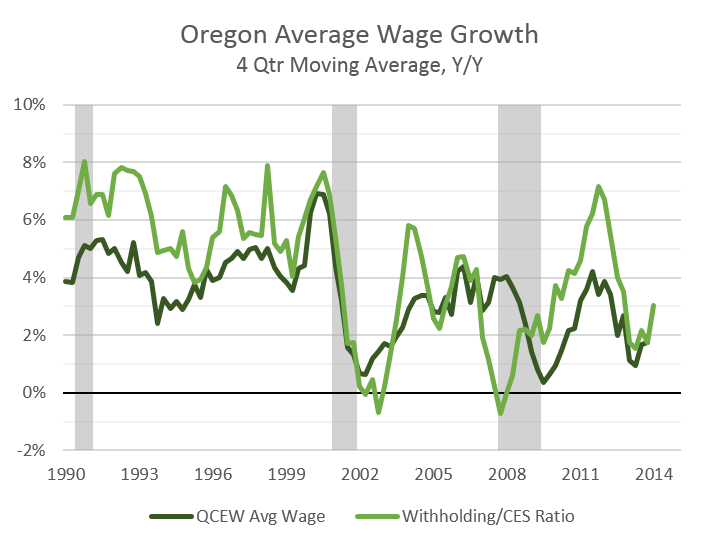 As seen below the average wage in Oregon is growing at about 2-3 percent per year, which is roughly in line with inflation, thus holding real wages effectively unchanged. As Mark said at PNREC, and as reported by Molly Young in The Oregonian, the feel good nature of the recovery is still not here yet and what feels good to most people is money in their pocket. Note that the divergences in 2007 and 2011 in both graphs is due to withholding table changes and not fundamental economic changes. With that being said, the economy continues to improve and momentum, at least in Oregon, is being built in recent months. As more job opportunities come available and filled, the labor market will tighten. This is currently happening. Once that occurs, wages should start to increase as employers have to compete for the best candidates and to retain existing employees. (Aside: when firms and industries talk about labor shortages, watch what happens to wages. If there truly is a shortage, wages will need to increase to attract more workers.) As wages rise, this will attract more workers back into the labor force. More on our office’s expectations on the labor force participation rate and employment to population ratio in the forecast next week.